I loved Angel's Blood, and I super love this book. I'll just jump right in. So excited! First things first.... ELENA IS AN ANGEL! That made me so so so happy :) I always felt this sadness about Elena and Raphael falling in love because she would age and die and he would stay young and beautiful forever. But now they can be together forever. I thought it was so sweet that Raphael waited for her and then throughout the year that she slept he would constantly talk to her and check on her mind. 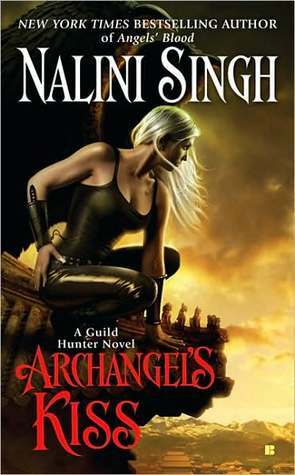 There were two things that I really loved about this book: we get to see Elena and Raphael's relationship develop and we get some real insight into how angel society works. Elena and Raphael really begin to trust each other in this book. Elena's nightmares about her past are becoming more frequent and more vivid and she turns to Raphael to help her and he begins to open up about his own child hood. You can really see the love start to bloom between them. Now that Elena has become the first angel made the recent memory things have been stirred up in Refuge. Michaela wants to kill her even more because Elena is now the center of attention (and she is wayyyy better than Michaela). There is an open spot for a new Archangel and someone thinks that by killing Elena they will get a free ticket onto the Cadre of 10. And (!) we get to meet little kid angels. So So So So cute. Sam is so cute and I was beyond pissed off that he was attacked. What kind of sick person pulverizes a child? (well, you will find out who in the book). And Lijuan is freaky, you find out all sorts of crazy (true) rumors about her and the dead. She also makes zombies. I think my favorite scene in the book is when they are in China and Raphael gives Elena her new knife and she gives him an amber ring. It is the best. You see him feel truly happy and how much he loves her and how he is slowly becoming conscious of how important it is to make other people happy. I also like the scene where Elena gives Sam the dagger that is made out of the dragon eye. It was so heart breaking when Sam got hurt, so to see him to happy about the dagger really got to me. I love that we get to meet the rest of the Seven in this book. My favorite is Aodhan, but I have always loved the damaged male characters, and I just picture his as so beyond beautiful in my head, and that moment when Elena asked him to kneel so she could use his sword. Gave me chills. We also meet Galen and Naasir who is a naughty boy and drinks blood from angels. I love this book :) and I am rushing so I can reread the next book in the series.